There was a time, a mere few years ago, when celebrity sightings in Center City were common. Jeff Daniels, Megan Fox, Mark Wahlberg and Terrance Howard could be seen around town, strolling the sidewalks, sipping coffee, firing blanks at the street from atop a building at 17th and Walnut. Movies were being made in the City of Brotherly Love, and many of them weren’t even the work of hometown director M. Night Shyamalan. This year, however, the number of major Hollywood movies filmed in Philadelphia can be counted on one hand. The heavyweight of the bunch, Creed, will be released Wednesday in area theaters. 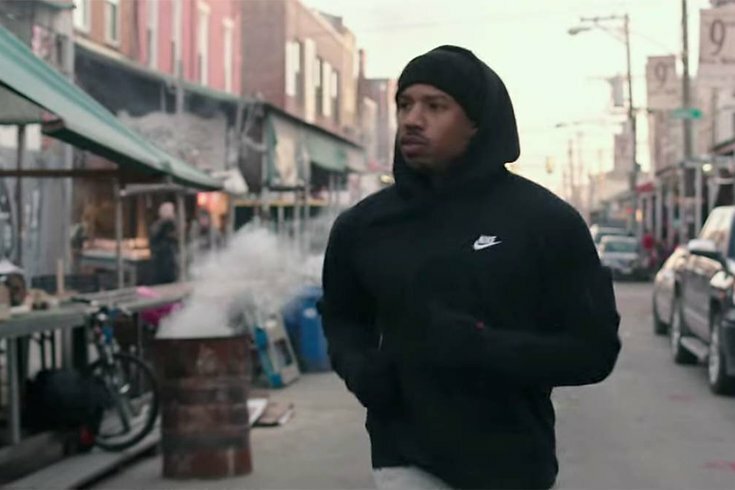 The movie is essentially the seventh in the Rocky franchise and the city is featured prominently in the trailers, from images of the skyline to shots of 52nd Street and the Italian Market. None of the other movies filmed in 2015 will be released this calendar year. Creed’s loneliness can largely be blamed on the budget standoff in Harrisburg, which leaves Pennsylvania’s Film Production Tax Credit Program in limbo. Film productions can qualify for the program, which is capped at $60 million, if 60 percent of its production expenses are spent on “qualifying expenditures” in Pennsylvania – and that can include almost everything but marketing. But as the impasse in the legislature continues, new credits are not forthcoming and neither are new movies. “We don’t have a budget so we lost a lot of shows,” says Sharon Pinkenson, executive director of the Greater Philadelphia Film Office. She says that Wheel of Fortune was the only television show filmed in the city this year, along with 34 commercials, 13 documentaries, and 19 music videos. After all, there are plenty of other states unparalyzed by partisan conflict and ready to pay for productions. A 2014 study from the National Conference of State Legislatures found that 39 states and Puerto Rico offer some form of tax incentives designed to attract filmmakers. In September, North Carolina approved a 2015-16 state budget, which allocates $60 million to the film and entertainment grant over the next two years. Since then, however, several states have scaled back their programs after criticism from lawmakers and activists on both the left and the right. Conservative governors in Alaska and Michigan have scrapped film incentives entirely. While the Film Production Tax Credit is not expected to be eliminated from the eventual Pennsylvania budget, the program suffers from the same reputation that dogs its defeated counterparts. Most studies of film incentives have found very limited benefits for the states that issue them. The Boston Federal Reserve issued one of the first comprehensive reviews of the programs and found that tax incentives did attract film productions to states that did not have a native industry, but that little economic activity was stimulated as a result. An in-depth 2014 review of Louisiana’s film credit program, the most generous in the nation, found it won back, at most, 37 cents in taxes for every public dollar spent. A 2010 study in Michigan found the state got $60 million in economic activity for every $100 million in public money spent. Looking at the possible tax revenues associated with lifting the cap on Pennsylvania’s tax credit program, the Independent Fiscal Office found that the state would get 14 cents back on every dollar. Pinkenson and other tax credit boosters insist that critics don’t take into account the ripple effects of the credit program: the Creed crew needed to stay in Center City hotels, gas up their cars, dry clean their clothes, and keep the workers full of hoagies and coffee. In a city like Philadelphia, which enjoys a thriving theater scene and its attendant backstage workers, a certain amount of work for locals will be directly generated as well. This, in turn, will allow talented people to remain in the region from costume designers to stagehands, instead of being forced to migrate – or at least commute – to New York or Georgia (which also offers a lavish film credit). After Michigan installed a tax incentive program, reports professor Daniel Herbert, larger numbers of graduates from the University of Michigan’s Department of Screen Arts and Cultures began staying in-state for the reliable work, instead of moving to California or New York after graduation. Now Herbert reports the exodus to the coasts has begun again. Then there’s the prestige associated with nationally consumed films. Historically many of the movies brought to Philadelphia by the Film Production Tax Credit have used the city as a near-anonymous backdrop or as a stand-in for New York. In addition to being critical bombs, few movies bankrolled with tax credit can truly be said to boost the city’s image in any way. Shooter, Transformers: Revenge of the Fallen, The Answer Man, The Best and the Brightest, Dead Man Down, or Paranoia could be set anywhere. Besides Creed, the only other major productions filmed in the city this year is Equity, a Wall Street drama in which Philly will stand in for New York. Before the Film Production Tax Credit films like Blow Out, 12 Monkeys or, say, Rocky were filmed in Philadelphia because the scripts specifically required the setting. Hollywood came to Philly less often, but they still came when the script called for it. Creed cost about $35 million and will be getting back about $8 million from Pennsylvania. (The producers were able to make use of the prior fiscal year’s allocation.) Would it have been filmed in Philly without the promise of tax credits?